Delhi has gone to the dogs. A dog bite is reported every six minutes, according to data thrown up by an RTI petition on dog bites. Other sources put that figure at one bite every minute. Either way, the reality is stark. Even by official statistics, a total of 91,656 dog bites were reported in 11 months; government records put the figure of stray dogs at 4 lakh, though unofficial reports say it's closer to 7 lakh canines on the streets. The good news, such as it is, is that your chances of being bitten are under 0.5 percent (if we take the capital's base population as 1.68 crore and dog population at 4 lakh). In other words, no more or less than your chances of dying in a road accident. Or being murdered. But the stray dog issue isn't of mortality - it's of fear, and inconvenience, and disease. It's of parents who fear for their children and old people who limit their movement outdoors to avoid strays. Neither of these are tenable realities for a country's capital, and for a city as populated as Delhi. Clearly, it's time for Delhi to get its act together. And to face the facts. The invariable reaction to a dog bite, or worse a dog-mauling incident, is to blame dogs. The voiceless strays who lord over our streets. Never the civic administration that has been tasked with sterilising and immunising them. Or the irresponsible owners whose pedigreed dogs are as much to blame for the increasing number of bites as strays. Are strays the real problem? Kashish, an eight-year-old, was playing in a park in Malviya Nagar when a neighbour's pet dog savagely attacked her. In a more publicly reported incident, Maharashtra Navnirman Sena chief Raj Thackeray's wife Sharmila was bitten on her face by their pet dog, Bond, in Mumbai - an attack that required her to undergo plastic surgery. In Kochi, of the 1,074 dog bite cases reported in 2015, pet dogs were the culprits in 75.6% cases. Stray dogs accounted for just 24.4%. But Delhi loves its pedigrees too much to point a finger at them. The numbers floating around are often deliberately vague; some contradict each other. Around 84 dogs are sterilised a day. The number of humans bitten each day is three times more: 252. The last dog census was conducted in 2009, according to which the dog population in Delhi stood at 5.62 lakh. Yet, there is a dispute over who actually conducted the survey, the New Delhi Municipal Corporation or a private body. The only other official figure is the 19th Livestock Census of 2012 which put the number (of animals) at around 17 lakh. This includes livestock, but excludes monkeys. A dog census is now being planned by South Delhi Municipal Corporation (SDMC), East Delhi Municipal Corporation (EDMC) and North Delhi Municipal Corporation (NDMC). What we do know is that Delhi's dog population is on a steady, upward graph and even fair-minded animal-activists acknowledge that protestors have a point. Others, like Suyash Upadhyaya, a sports journalist, found themselves victims of a dog bite when they inadvertently injured a street dog - in his case, a stray who's tail he stepped on on a pitch dark road. Doctors who attended to him instructed him to take five anti-rabies injections as a preventive measure. He was asked to buy the injections from the chemists and get the shots administered at any hospital over a period of 2-3 weeks. He went to different hospitals each time depending on what was convenient locationally - but none of the hospitals he went to for the shots registered him as a 'dog bite' patient. That means official figures are highly underreported. And yet, the reverse problem also exists. "Who is counting the dog bites at hospitals? No one has the time. Besides if a dog bites a person s/he is advised to take up to 7 injections. If the same person visits different hospitals, the statistics hit the ceiling," argues Anjali Sharma, legal adviser to AWBI. Geeta Seshamani, who runs the oldest animal welfare facility Friendicoes, says, "The dog bite figures are probably derived from the number of sales of anti-rabies vaccines and hence not true. Most importantly, most of the dogs that bite are usually pets - these figures do not separate pet dogs from street dogs." The courts endorse Animal Birth Control (ABC) as the only scientific, humane, rational and lawful solution to controlling the stray dog population and eradicating the threat of rabies. In November, the Supreme Court put an end to the inhumane and indiscriminate killing of stray dogs across the country. Only dogs that are mortally ill or critically wounded can be euthanised by civic bodies in a humane manner under provisions of the Prevention of Cruelty to Animals Act and the Animal Birth Control Rules of 2001. Even rabid dogs are to be isolated and allowed to die a natural death. In its interim order, the Supreme Court bench comprising Justices Dipak Misra and SK Singh said local authorities had a "sacrosanct duty" to provide the requisite infrastructure - so that humans and canines can coexist harmoniously. And so that humans do not suffer because of administrative lapses. Several RWAs across Delhi have taken it upon themselves to sterilise and vaccinate dogs in their areas. Dog lovers sponsor sterilisations to keep the population in check, numbers which are not reflected in the RTI report. Is this an unsolvable problem? No. Dog overpopulation could have been sorted out if the civic bodies got their act together and implemented the ABC programme in earnest. Instead the civic body (NDMC) decided to run a text message campaign last November asking if Delhi dogs should be relocated to sanctuaries. A week later NDMC was forced to withdraw the 'illegal' campaign. The ever-increasing dog population has been a concern across India, not just Delhi. A couple of years ago, Chennai wanted to dump its dogs in a pound. More recently, Kerala started culling dogs till it was made to realise that the solution lay in a rigorous sterilisation campaign. Dogs cannot be wished away to a pound or a shelter which most people imagine as a paradise for canines. Also read- Tail of hypocrisy: why does BJP protect cows but brutalise bulls? Anjali Gopalan, director of Naaz Foundation and trustee of All Creatures Big and Small, a non-profit organisation that rehabilitates animals in distress, says sending dogs to the pounds is impractical. "Who will pick up the dogs? Where will they get the money to feed them? Who will fund their treatment? Will the pounds be able to hold dogs indefinitely? How will they deal with fights as dogs are territorial?" She says dogs are an important part of our ecology, they keep rodents at bay. The Surat plague of 1994 is a case in point. The mayor removed all the city's strays and the city lost over a hundred people to plague. Sterilisation is the more cost-effective solution as opposed to a dog pound, Gopalan points out. Sterilised dogs do not bite, as the surgical intervention removes the testosterone from the male and all sexual incentive to fight. Her argument is endorsed by Gauri Maulekhi, a co-opted member of AWBI. Maulekhi spent time in Kerala last year to educate the powers-that-be on the ridiculousness of culling street dogs to check their population. "Places where the ABC programme has been implemented over a period of time they have become rabies-free with minimum cases of conflict," she says. Besides, dog pounds are illegal. "Stray dogs cannot be relocated to sanctuaries or pounds. 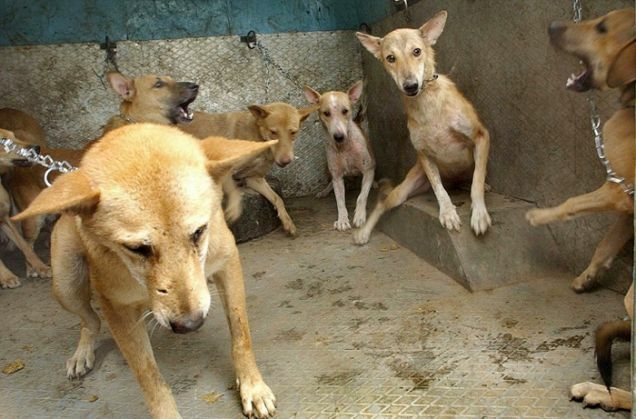 Dog pounds are illegal," says Sharma, an advocate for AWBI. She cites Rule 7(6) of the Animal Birth Control (Dogs) Rules enacted under Section 38 of the Prevention of Cruelty to Animals Act to make her point. "They can only be sterilised to control their population, immunised against rabies and then released back to the very same location from which they were picked up." First, the civic body needs strong will to tackle the dog 'menace', along with better infrastructure, such as skilled dog catchers and more animal ambulances. Therein lies the solution. Not in sending man's best friend to a pound. Or culling.